Two Crafts for the Price of One! 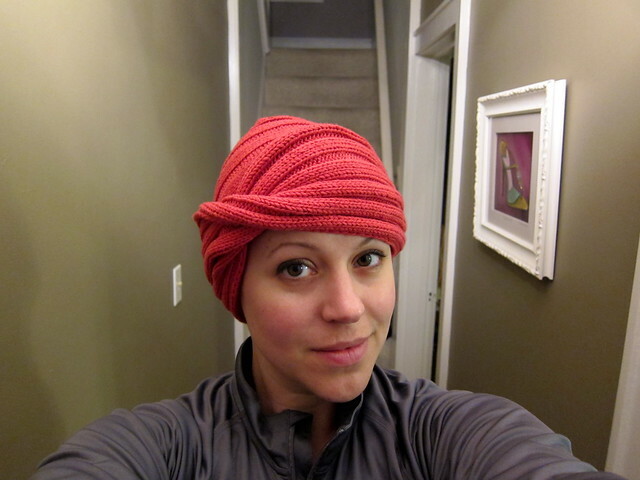 First up - a "chemo cap" I knitted for work. I donated a "handmade winter hat" for an auction fundraiser and the recipient wanted me to knit and donate a hat for cancer patients. After looking through many patterns on Ravelry, I chose the most fashionable hat I could find. 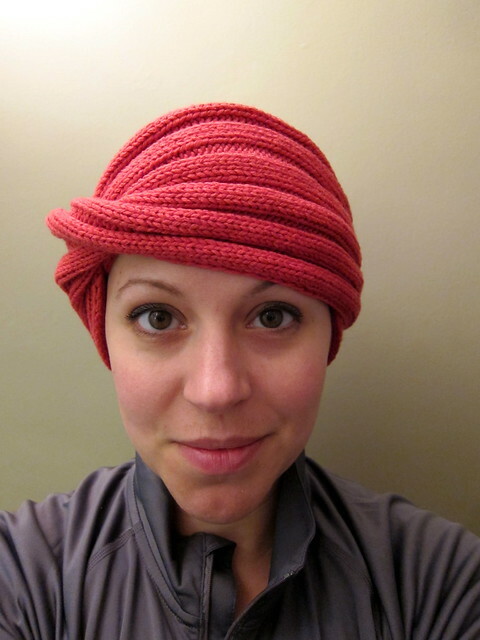 Not your traditional "Chemo Cap"
The seamed portion (at the lower left) is worn on the head and then you twist the loop around the back and again the front. I played around with it and there are so many ways you can wear it. I hope whoever receives it feels fabulous when they wear it. Our good friends had a baby boy over Labor Day and I wanted to make something special for Baby Peter. Since Lauren & Justin moved to California I thought a little sleep sack would be perfect because even CA babies need to stay warm. Modifications: The only major modification I made was to the polka dot bias binding you see in the picture above. 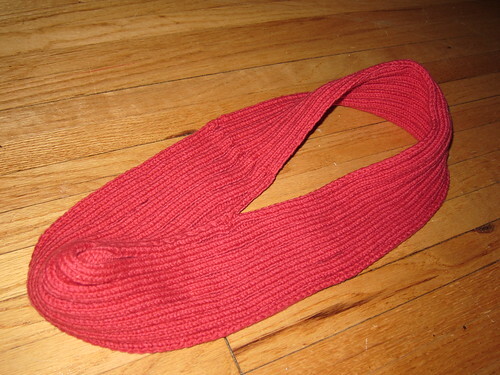 The pattern calls for the binding (on the right) to stop at the neckline since the rest of the seam would be hidden when the sack is closed. This just didn't feel finished to me so I mitered the corner and continued the binding down to the bottom. I also sewed the velcro on so you couldn't see the stitches from the front. Finally I also serged the bottom seam so it would be nice and neat. All small details but it really made the finished product look more professional. 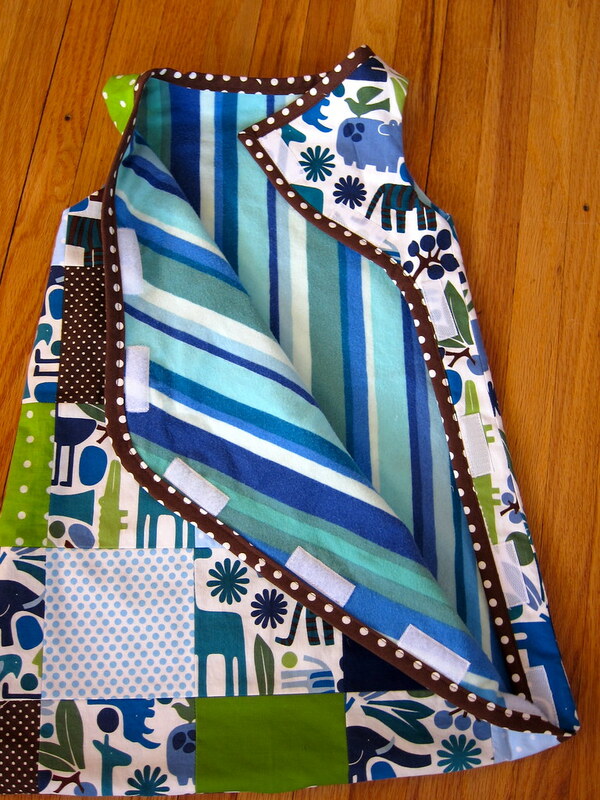 I love this sleep sack and will be making more for friends. I didn't use a pattern - I just grabbed some extra fabric I had and whipped this up to hold the "plastic food" I bought from work. 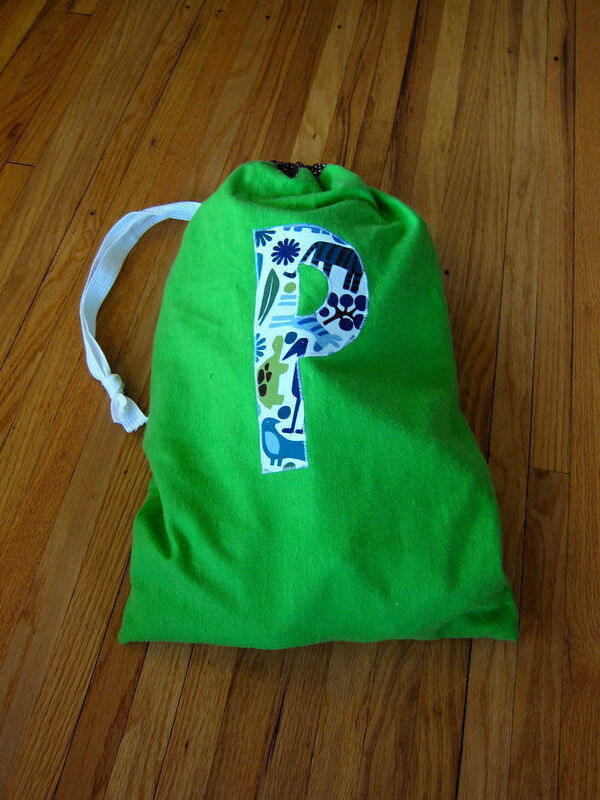 I applied the "P" using Steam-a-Seam 2 then satin-stitched around the edge. It took about a half hour all told. Now for an extra special treat! 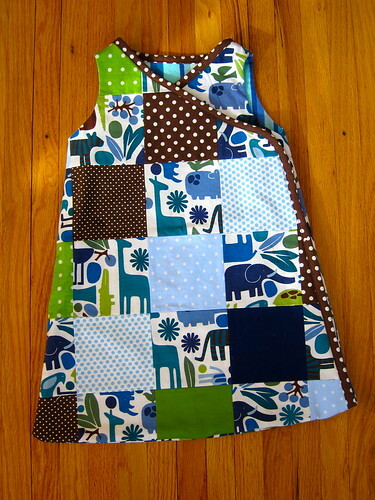 LOVE how your sleep sack turned out! I like what you did with the binding- I totally agree on it being more finished that way. I think that I need to make another for my little girl now. 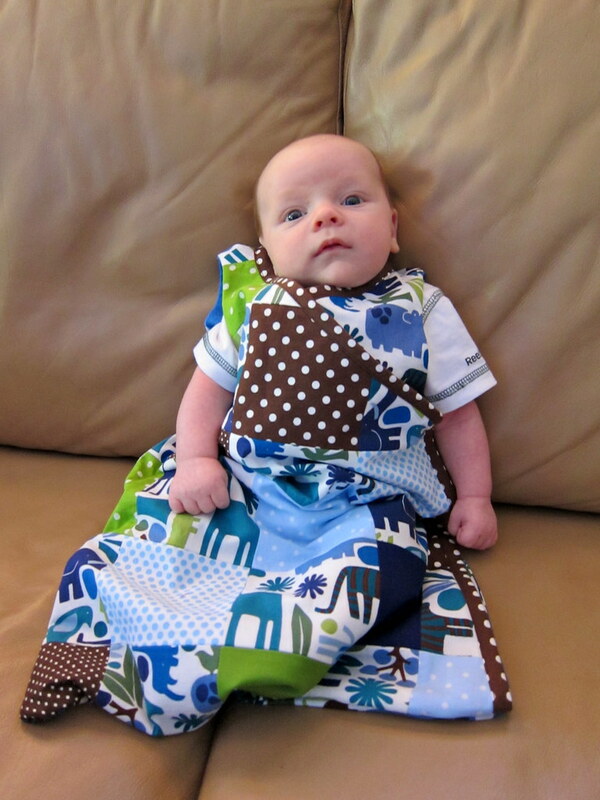 Little Luke is the perfect model for your gorgeous sleep sack! VERY CUTE! I just stumbled on your blog via Ravelry and I've got to compliment you on what I've seen so far. Your do really special work! Little P loves his gifts and we do too! Thanks!!!!! Thanks for finding a fabulous chemo cap. I love it and will make it one of my next chemo cap knits. And that sleep sak - just crazy cute! Hi Brandy! It has been too long! I love the chemo hat you knit - really lovely. I was thinking about you today because I am finally knitting from the toy book you got for me - my sister is having another baby in the spring so I am going to make him the giraffe. I am excited to start. I am running to the yarn shop today before it closes to get what I need. I hope you are well. Love your blog although I don't get on blogspot as often as I should. I will be in touch when I get to MN - hopefully we will have time to visit your LYS. Happy New Year!